I missed him — that was really the biggest part. So I moved to be with him,” Monica said. While she was happy to be with Daniel again, she struggled to find work. They would often talk about starting a business that they could do together and Monica was interested in the nascent coffeehouse industry. As fate would have it, while Daniel’s parents were on their yearly vacation to Sanibel Island that year, they had noticed that a coffeehouse called The Bean had gone up for sale. Monica said, jokingly, “let’s buy it.” Next thing she knew, Daniel had obtained the financing to purchase the business and they were looking for the least expensive house available on the island. They quickly sold their house in Ohio and moved to Sanibel sight unseen. After a year of working and learning, Daniel and Monica expanded the business and The Bean of Sanibel Island became a smash hit. It had a cool island vibe, great staff, and the Dixes were always there forming relationships with their customers and working alongside their staff. They had no problem pulling in revenue; they could make their rent payments from souvenir sales alone. They sold t-shirts, mugs, and popular bumper stickers that said “I heart the Bean.” They asked their customers to take photos of themselves with their Bean bumper stickers and to send them the photos to hang on the shop wall. Their customers did not disappoint — the walls were full of photos. wildly successful not only in providing a good caffeine fix, but in offering a place for people to come together. During this time, they also decided they were ready to try for a baby, something Monica wasn’t so sure about in the earlier years of their marriage. After Monica became pregnant, Daniel started feeling like he needed to learn more about Catholicism. That oath from his wedding day was hanging over his head now that he had a child on the way. He went to the local priest on Sanibel Island and began to ask some questions about the issues that are typically the most difficult for people to accept about the faith: “What about all this Mary stuff… and praying to the Saints, what’s that all about? What’s the problem with contraception and what about homosexuality?” The priest asked Daniel two questions: “Daniel, do you believe that you have to learn about something before you discredit it?” Daniel said, “yes.” The priest then asked, “do you believe in God and that you should pray when you need guidance?” Daniel said, “yes, I do.” So the priest said, “if you do those two things, learn about the faith and pray, the Church demands that you follow your conscience.” This was something he could accept; no pressure — learn, pray, and decide for himself. foundation that would guide him to get his master’s degree in theology. While visiting Monica’s sister in Steubenville, Ohio, Daniel happened upon a brochure for Ave Maria University’s Institute for Pastoral Theology (IPT) program. While there, they also attended a charismatic Mass at Franciscan University, which was unlike the Catholic Masses they were accustomed to. It seemed serendipitous that he would go to this Mass and find a brochure for the IPT program that was located in Naples, not far from where they were already living; he felt called to join, and so he started the three-year journey. The IPT was demanding, required constant study, and a lot of hard work, so while this period of their lives was extremely busy, the young couple still always found the time to develop spiritually, to spend time with their family, and for Daniel to pursue his theology degree. When he started the IPT program, Daniel said, “we had one coffeehouse and one child. When I finished the program, we had four coffeehouses and Monica was pregnant with our third child.” Monica said, “we just kept saying yes to God.” They were open to new opportunities and things just kept developing. Owning coffeehouses had become their way of life, not just because it paid their bills, but because they enjoyed it. So when they moved to Ave with a four – and two-year old, and a six-week old, opening the Bean made sense. When they opened The Bean of Ave Maria, they decided to cash out on their other coffeehouses, and the new Bean became a second home to them and their children. Bella, Gigi and Josie could often be found helping behind the counter and around the coffeehouse. Some years after opening the Bean of Ave Mar ia, the developers of the town approached them about opening a restaurant in La Piazza. Another investment in the struggling town of Ave Maria was a scary proposition but, Daniel said, “more than anything we wanted the town to grow and survive. We have always been fullyinvested in this town.” The developers suggested an Italian restaurant, but the Dixes understood their market and envisioned another idea: a bar. Not just any bar, but a pub. They had no interest in owning a typical American bar, but a pub was a different entity all together. Their vision was not a place to sit around and drink, but rather another social gathering spot similar to the spirit of The Bean; a place for community to gather and strengthen their relationships. The Queen Mary Pub and Grille opened its doors on September 11, 2009. Much like the Bean, the townspeople embraced this new business with open arms. Due to the struggling economy, Daniel started getting a bit desperate to support his family. He needed to take on additional work to pay the bills. Ave Maria was having a bit of a problem with bears making their way into La Piazza at night to sniff out the garbage and the town really needed someone to collect the garbage at night to help prevent this problem. Daniel needed more work that would fit into his already busy schedule, so he took a job driving a golf cart around at night to collect the trash. He recalls local fr ends and patrons, like Tom DiFlorio, calling him up to ask if they could come along and collect garbage just to give him a hand and hang out for a bit. He would also often take his daughters with him. When Bella tells me about her experience collecting garbage with her dad, her face lights up! Who would think that a teenage girl would have such fond memories of collecting garbage? But, then again, it’s not really about the garbage. It’s remembering the community’s love for her father, the appreciation for his hard work, and the special time spent bonding with her. At this time, Monica also worked at the Montessori school and cooked meals for a family in town as a private chef. 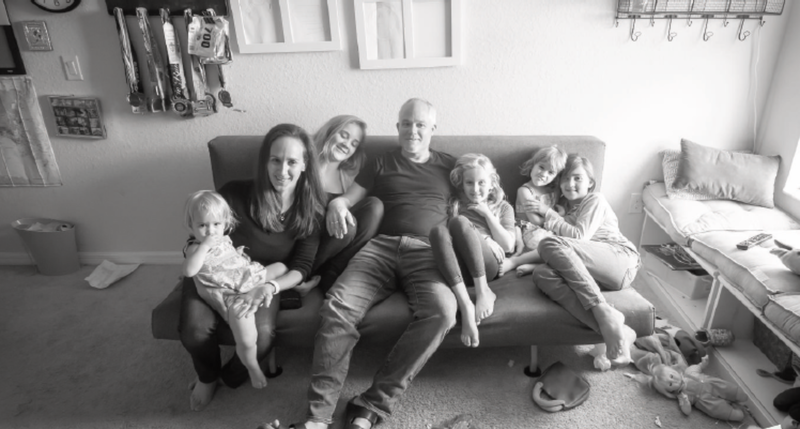 Monica’s experience in becoming a mom had also led her to become a Bradley Method instructor. The objective of the Bradley Method is to help women through a pregnancy with the least amount of interventions. “It was really cool too that my mother -in-law did the classes with us, and then she went off and took training to become a Doula. She was there for Bella’s and Gigi’s births,”Monica said. And speaking of family members being present at births, Bella’s was at Rosa’s birth, which was a special moment for the family. She had expressed interest in being there from the beginning of Monica’s pregnancy and though Monica was worried that it would be a long labor and Bella might get bored, Rosa didn’t take too long to come out and Bella got to be there for the whole thing. Eventually, the town star ted to grow and the financial situation of the Bean and Queen Mary Pub began looking up. By 2014, both businesses were doing quite well but Monica and Daniel were ready for a change. Monica was pregnant with Rosa at the time, and Daniel was looking at other career options that didn’t require rising before the sun and going to sleep early into the next morning. They sold both businesses. You can find Daniel and Monica running around town before the sun rises with other runners in the Ave Maria community. Monica has enjoyed staying home with her five beautiful girls whom she had been homeschooling, but is now transitioning into having four of them in school in Naples and just having Rosa home with her. She’s looking forward to maybe taking an art class or two. When she was pregnant with Rosa, she would come home from working at the Montessori school feeling so sick, she would just sit in a chair and rest. 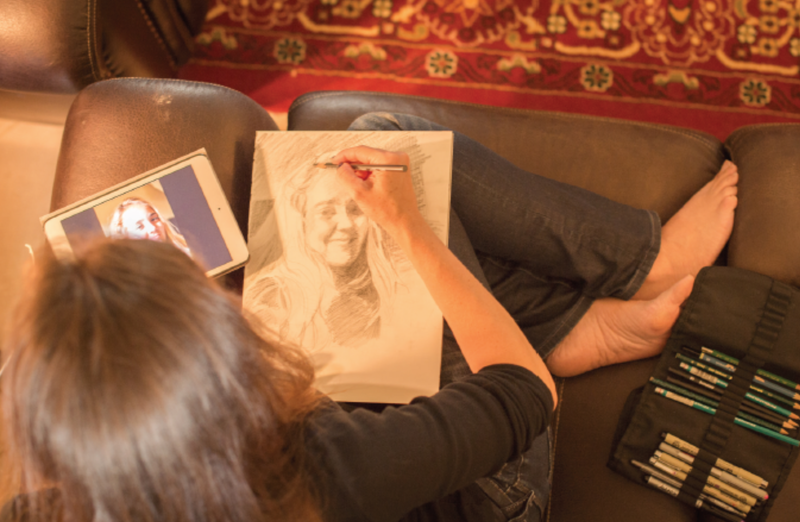 She recalls not being able to read or watch TV because it would make her feel nauseous, but drawing made her feel good. She started drawing her family while they were watching TV because it was the only time they would sit still and realized the drawings were pretty good. “I noticed that people who had known me for six or seven years by then had no idea I was an artist, and I thought, ‘who’s fault is that? !’ I felt like I was hiding a part of me,” Monica said. Since then, she’s always made time to draw. Daniel and Monica celebrated their 19th wedding anniversary this August and enjoy living an active and healthy lifestyle. They feel so blessed to call this wonderful community home. These days, on a Sunday after Mass, the family of seven (eight including Swagger ), can be found together at home. 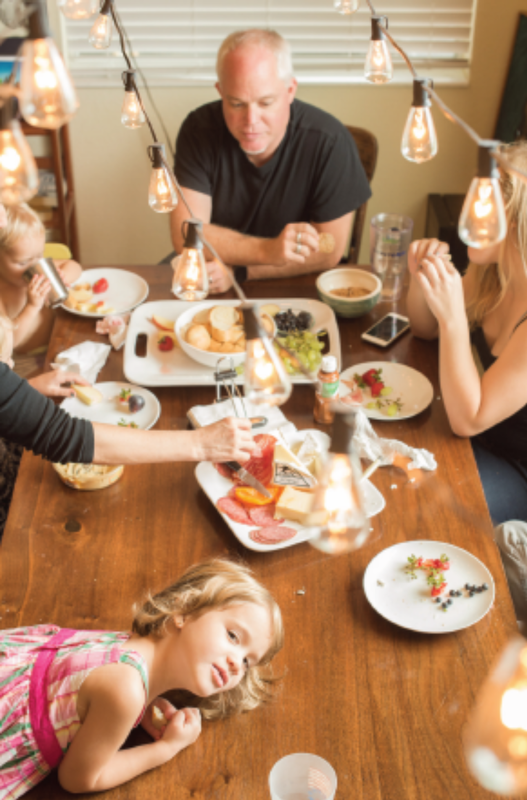 Chet Baker plays on their stereo, while the family enjoys a spread of bread, gluten free crackers, meats, cheeses and fruit. The girls excitedly talk about the upcoming start of school, cracking jokes with each other and taking turns sharing stories. It is great to see the love and admiration that the girls have for their parents and their perseverance through the more difficult times. One of Daniel’s most priceless memories is from when he was running the Napa Valley Marathon in California and Bella was watching the race with her aunt. Daniel suffered a pretty severe injury during the race which slowed him down tremendously. Bella waited and waited for him at the finish line. After learning of the injury, Bella’s aunt suggested they go looking for Daniel because perhaps he wouldn’t be able to finish the race. Bella insisted no, they should not do that because “Dixes never quit!” Shortly after, she cheered loudly as she watched him hobble across the finish line. She was right. If this example alone didn’t prove it, every piece of their lives leading up to it has made it abundantly clear that if one thing is for certain, it’s that Dixes never quit. By Meli Neubek and Taresa Fassbender – originally published as the cover story for the inaugural issue of the print magazine Ave Maria Living, Issue #1, September 2016. What a beautiful and insightful article about one of Ave’s founding families. 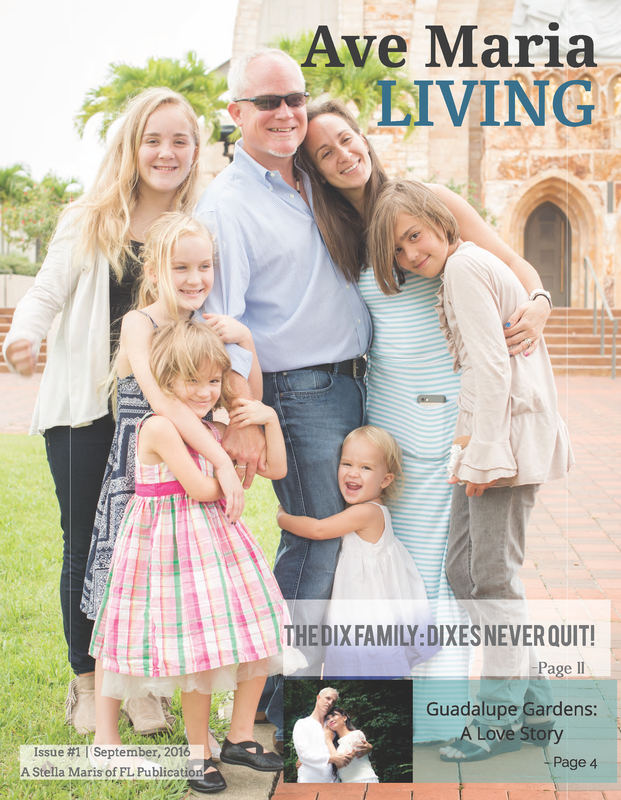 The Dixes are an inspiration for all who bravely follow God’s calling. 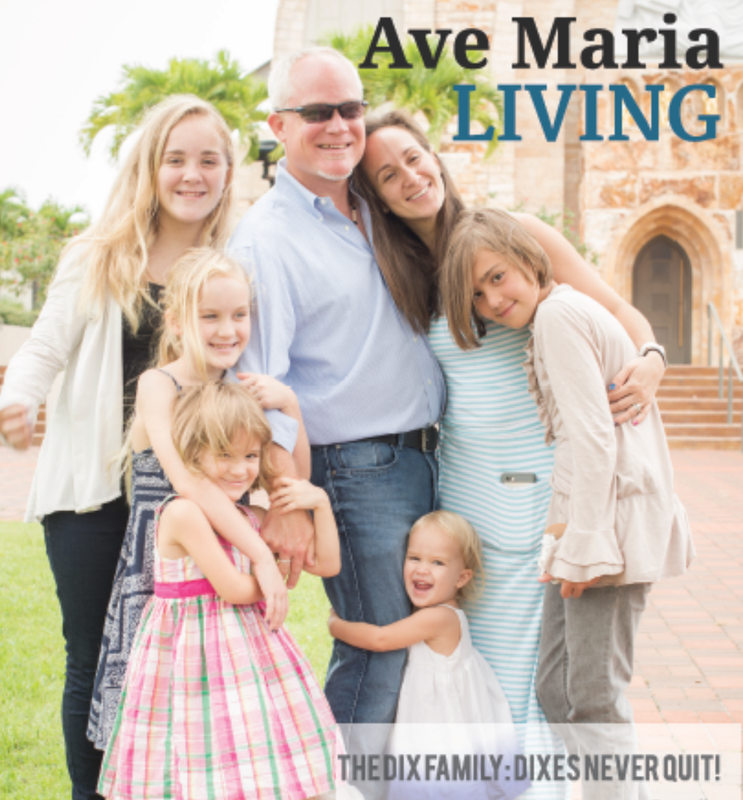 I look forward to more from the Ave Maria Living magazine. Bravo!